Nigeria's president has said the hundreds of posts on his Facebook page helped persuade him to reverse his suspension of the national football team from international competition. 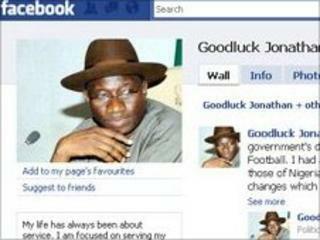 "I have listened to your voices," Goodluck Jonathan said in a posting on the social networking site. He had banned the team for two years after their poor World Cup campaign. He overturned his decision ahead of a Monday deadline from the football world governing body to expel Nigeria. Under Fifa rules, government interference with national teams is strictly forbidden. The president lifted the ban after the Nigerian Football Federation (NFF) promised to disband and rebuild the side. "I read your comments and took them into account in the government's decision to rescind the suspension of Nigeria from international football," Mr Jonathan said on Facebook on Tuesday. The president, who only set up his Facebook page at the beginning of last week - two days before he banned the Super Eagles - has more than 76,000 Facebook followers. "I had a meeting with the NFF today and conveyed my disappointment and those of Nigerians on this page and received assurances that there will be positive changes," he said. "We must now work together to make sure that the NFF and our players do us proud in future events," he said, ending the message with his initials "GEJ". Nigeria's Super Eagles were knocked out in the group stages of the World Cup taking place in South Africa without winning a game.